It looks like Apple's iPhone has finally met its match. Samsung announced that it has taken 3 million pre-orders worldwide for the Galaxy S II smartphone and it hasn't even been announced in the U.S., Apple's home turf. Samsung plans to release its latest Android flagship phone in over 120 countries, and says that carriers across the globe pre-ordered 3 million Galaxy S II smartphones, the successor of the Samsung Galaxy S, which sold over 10 million last year. Note that the 3 million figure is what carriers have ordered, not what customers bought already, but the figure is nonetheless impressive. If the Samsung Galaxy S II looks familiar it's because it resembles Apple's popular iPhone 4--but the similarities end here. The Galaxy S II has an "absolutely gorgeous" 4.3-inch Super AMOLED display, an 8-megapixel camera, 16GB of built-in storage, running on a dual-core 1.2GHz processor with 1GB or RAM memory. It comes with Android 2.3 and reviewers seem to love it (minus the battery life). It's probably the best Android smartphone so far. 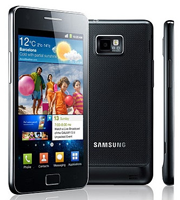 Could the Samsung Galaxy S II be the phone to beat the iPhone in sales? Samsung said it plans to sell around 10 million devices by the end of the year, a respectable figure which most Android smartphone manufacturers would only dream of for a single device. But compared to the iPhone... well, only in Q4 2010 Apple sold over 14 million iPhones. That's more iPhones sold in three months than Samsung plans to sell all year with the Galaxy S II. Samsung is definitely riding the hype wave with its top notch Android phone, and this will help sales, but we have yet to see Apple's iPhone offering this year. Rumor has it that we will only see a new iPhone in September, which means that Samsung might be able to bank on the fact that many iPhone contracts will expire in July, leaving a window of opportunity for would-be switchers.